U.S. Conducts Precision Airstrikes On Al-Qaeda Cells In Southeastern Libya (Photos) 4.3333333333333 out of 5 based on 6 ratings. 6 user reviews. On November 30, the U.S. Africa Command (AFRICOM) said that it had killed 11 personnel of al-Qaeda and destroyed 4 military vehicles in precision airstrikes on the southeastern Libyan region of al-Uwaynat a day ago. “AFRICOM will use precision strikes to deny terrorists safe haven in Libya. We will keep pressure on their network, and they remain vulnerable wherever they are,” said U.S. Marine Corps Maj. Gen. Gregg P. Olson, director of operations of the AFRICOM, in an official press release. The AFRICOM said that the airstrikes were coordinated with the Libyan Government of National Accord (GNA). According to the command assessment, no civilians were injured or killed in the airstrikes. Libyan sources confirmed that U.S. warplanes struck a convoy of Sahara Emirate, which is led by Algerian terrorist Yahya Abu al-Hammam. Sahara Emirate is one of the key branches of al-Qaeda in the Islamic Maghreb. This was the third airstrike by the U.S. against al-Qaeda cells in Libya this year. Last March, two commanders of the terrorist group were killed in an airstrike on southwestern town of Ubari. Three months later, another commander was killed in an airstrike on the northeastern town of Bani Walid. 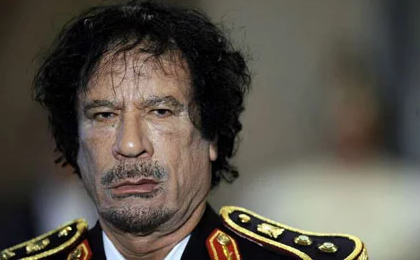 Since the overthrow of Gadhafi’s regime in 2011 by the NATO, Libya has turned into a safe haven for many terrorist groups, including al-Qaeda and ISIS. Ghadaffi: WTF… Only the third airstrike this year… You managed to kill 11 head-choppers? THAT’S IT?? Wow. Give yourselves a pat on the f’king back. Why don’t you AFRICOM cucks just start negotiating your withdrawal from Libya with al Qaeda right now. You’re obviously not up to the task of finding or defeating them (like I was). How’s that Libyan western democracy paradise going for you? Does anyone have running water or electricity yet? Yeah… I didn’t think so.